In May 2018, Ronnie and I took a 16-day trip around northern Europe. We had several focuses: art, trains, and chocolate!!! The last post was about the artisan chocolate scene in Berlin. This post is about another curated chocolate collection, this time in Amsterdam. 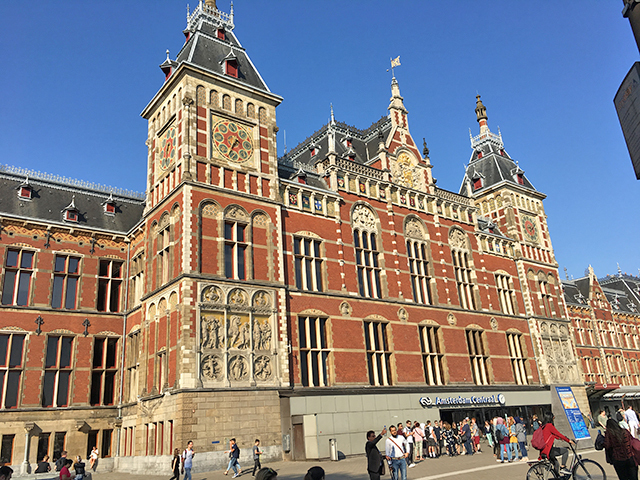 After 2 days in Berlin, where we hardly scratched the surface of the art and chocolate scenes, we spent a day on the train to Amsterdam. This was our least favorite train ride of the trip — it’s basically a 6-hour commuter route that’s stingy on the AC. Our reward on the end was more amazing art museums, a wonderful city, and chocolate! With only 2 days to enjoy, we managed one chocolate destination this time, but it was a charmer. Amsterdam’s Cacaomuseum is located a few blocks up from former cacao warehouses that have been converted into a tech hub. A windmill a couple of blocks in the other direction was used to grind cacao beans back in the day. It’s all serendipity according to Henkjan Laats, Cacaomuseum’s founder and director. When he rented the building in the Eastern Docklands neighborhood, he had no idea there was so much relevant history close by. Now it’s a pleasant tree-lined street with a tram running down the middle and lots of boutiques and interesting shops, including a peanut butter store(!) a couple of buildings down, where I got my beloved Pinderbass (peanut butter boss) T-shirt. When we showed up, Henkjan was sitting outside enjoying his lunch in the beautiful spring weather, but he said he was happy to give us a tour and talk chocolate with us. Henkjan opened the Cacaomuseum a year ago with his collection of chocolate ephemera and other historical chocolate-related objects, along with a curated selection of bars, many single origin small makers. He carries bars from around the world that he thinks are exceptional or highly interesting. Taza is only American maker currently carried at the shop, but he is always on the lookout for new additions to the collection. While showing us examples of early chocolate advertising in his collection, Henkjan talked about how the Dutch were early chocolate innovators. 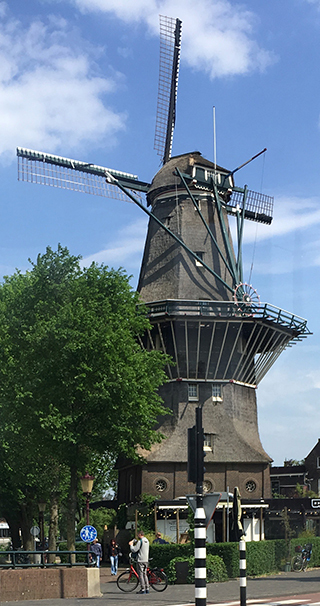 A Dutch chocolate maker and inventor, along with his father, developed the process for making cocoa powder that was stable and less acidic than the current standard method of simply grinding up cacao beans to make chocolate drinks. The cocoa powder is even named Dutch process. Dutch process chocolate mixes well with milk (hello, hot cocoa) and is useful in baking. At the time of its invention, the Dutch already controlled almost all trade in cacao beans and Amsterdam was the most important cacao port in the world. Add to that the invention of the cocoa press to separate cocoa butter from cocoa mass (by Papa van Houten), then the development of the alkalizing process (by C.J. van Houten), and the Dutch dominated cocoa processing. They might still today, although Dutch processing has suffered some dings lately due to the discovery that a lot of the phytonutrients in cacao are destroyed in alkalization. The Dutch were also trendsetters in advertising. The Droste Effect — the endlessly repeating image within an image — is named that because the visual trick was featured in early Droste chocolate marketing: a Droste chocolate tin printed with the image of a nurse holding the same tin with an image of the nurse holding the same tin, etc. Henkjan started his chocolate collection only 2 years ago, and it’s an interesting mix of vintage chocolate posters, tins, antique chocolate-making equipment, and other chocolate-themed ephemera. I don’t know if he’s just lucky or extremely fanatical, but in a short period of time he managed to acquire a good collection that takes some time to look through. He also has some original chocolate-themed art on the walls. 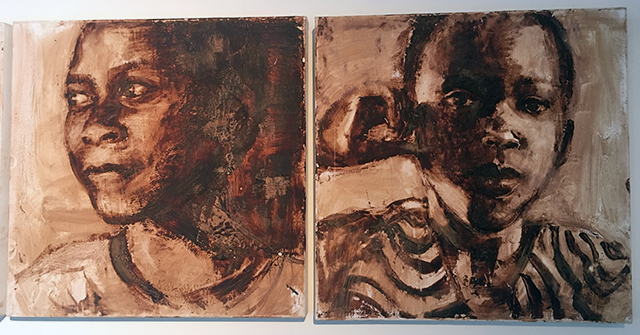 His wife, Laura Reiman, is an artist, and has painted maps of continents where cacao is grown or processed, such as South America, Africa, and Europe; plus portraits of cacao workers with the intent to highlight the culture and history of cacao, problems and all. The images are nicely rendered and I like the message, but what’s really unique about the pieces is that they are painted in chocolate. I don’t know how archival chocolate paint is, but it makes for a nice monochromatic medium with a full range of tones. When we visited, we saw the telltale signs of indie chocolate-making on the worktable where Laura leads chocolate painting workshops usually. Instead of brushes and paper, there were molds with chocolate in them. Henkjan told us that they were working on making their own bars, but it was a struggle. We will have to check in later to see if they succeeded. After touring the chocolate artifacts, it was on to tasting and talking about actual chocolate. We told Henkjan that we were mostly interested in local chocolate and preferred dark with 65%-75% as our sweet spot. He took it from there and gave us a range of options to enjoy. 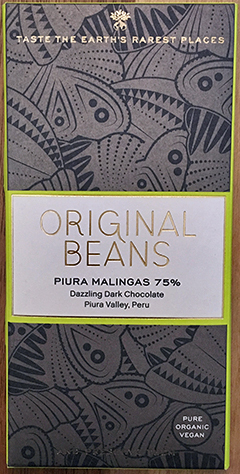 The first bar we tried was Dutch chocolate company Original Beans’ Piura Malingas 75%, a limited edition bar made from beans from Piura Valley, Peru. I’m not sure, but all of Original Beans’ bars might be limited editions. They have “Bean Teams” that look for unique, high quality cacao, then work with the farmers and local cooperatives to ensure that organic, sustainable methods are used to grow and harvest the cacao. They take it further, however, with their “One Bar, One Tree” program in which they help preserve and propagate more cacao trees of the unique lineages they discover. They also help cacao farmers restore the land, add irrigation, and protect native lands, such as in the case of Piura Valley, where they are protecting an area of dry forest, which is habitat for the endangered puma, birds and butterflies. The Piura Malingas bar has only 3 ingredients, all certified organic: Cacao mass, direct-trade cacao butter, and raw cane sugar. It’s gluten free and vegan. Seems like all the boxes have been checked, so how does it taste? The adjective Original Beans uses for this bar is “dazzling,” and that’s accurate for this very fruity and bright bar. It’s not a real chocolatey chocolate, because there are so many other flavors going on. The package mentions “notes of lemon, red berry and passionfruit,” and I tasted a tangy citrus-y flavor and red berry. Not sure about the passionfruit, but I did taste something like green apple, which might be what they are describing. Ronnie described it as a “bouquet of flavors,” fruity, not too sweet, with a nice aftertaste. The bar also had a smooth texture, with great mouthfeel. It tastes very rich, not bitter at all, and has a nutty aftertaste. It’s really good! 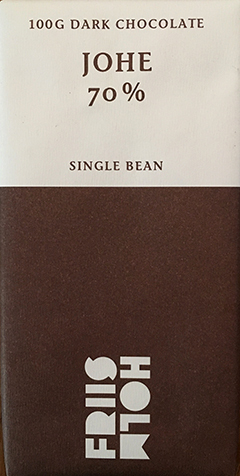 Another lovely bar recommended by Henkjan, was Danish chocolate maker, Friis Holm’s Johe 70% Dark, made from Nicaraguan beans. Like Original Beans, they source their beans directly from the farmers, it’s a single origin, and there are only 3 ingredients, no additives. And the hits just kept coming. 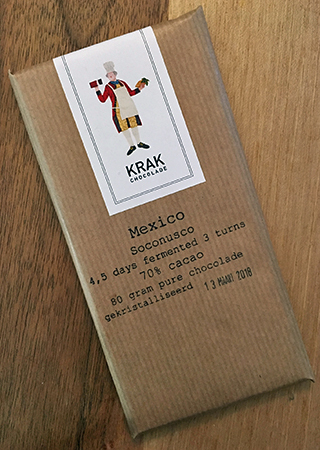 Another Dutch chocolate maker that Henkjan recommended was Krak Chocolade (and yes, we have been making the same wisecracks you are probably thinking of right now). I’m not really sure what’s up with the name, but we loved the 2 bars we tried from this new-ish (since 2013) chocolate maker. Krak’s founder, Mark Schimmel, a former pastry chef, is doing mostly bean to bar, somewhat similar to SFBA’s Dandelion Chocolate, with each type of bean getting its own custom fermentation and roasting. We tried 2 bars made from cacao from the same region, Soconusco (the very bottom of Mexico, next to Guatamala). Both bars were 70% cacao, made of 2 ingredients (cacao & cane sugar), and looked the same. The only difference was that the beans for one had been fermented 4.5 days and turned 3 times during the process. The other had beans that were fermented 5.5 days, but turned only once. It might not seem like much, but this slight variation made a big difference in flavor. This bar was a clear favorite with everyone who tried it. It’s perfect, except for one thing: Krak is not available in the U.S.
We also liked the 5.5, but we didn’t love it like the 4.5. It was not as hard to break, and it had a creamier mouthfeel. It had a bigger, more complex flavor that tasted darker with raisin overtones. The longer fermentation also made it taste more acidic. It’s still a very good bar that I would not refuse, but it is amazing what a difference the extra day of fermenting with less turning made with the same beans. This was a fun chocolate comparison, especially since we discovered a new favorite bar — and another reason to visit Amsterdam again! Since we were game to trying things outside our chocolate comfort zone, Henkjan pulled out a bar of not-quite chocolate for us to try. Instead of cacao, the bar was made from cupuassu (or cupuaçu) seeds. Cupuassu is a tropical rainforest tree related to cacao (both are from the Theobroma family) that grows in the Amazon. It grows big seed pods like cacao, and the fruit pulp that surrounds the seeds is popular in the region in desserts and such. 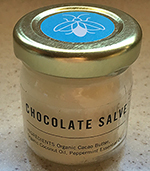 The beans are being marketed as a potential cacao alternative (but way tastier than carob for those unfortunate enough to have tried that chocolate-free mess). 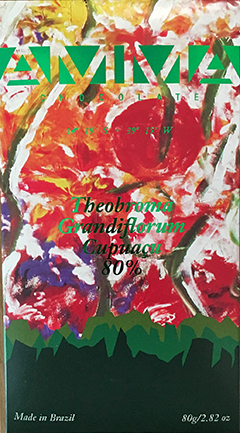 The bar we tried was Theobroma Grandiflorum Cupuassu 80% by AMMA. AMMA is a bean-to-bar maker in Brazil that also makes conventional chocolate bars from organic cacao beans. The cupuassu in this bar was not organic, but the cane sugar used to sweeten it was, and the bar is certified kosher, halal, gluten free, lactose free, and some other stuff that I don’t know what the logos mean. We were very excited to try this bar. It comes in a beautiful, but chaotic-looking, wrapper with lots of information printed both inside and out. When we opened the package, we notice that although it’s 80% cupuassu, it’s lighter in color than an 80% cacao bar. It has a fermented chocolate-esque aroma, more like a chocolate dessert smell than straight up cacao, if that makes sense. It’s a raw bar, so it has no snap. Instead it has a clay texture, not super grainy, but kind of like solid sludge. It’s not unpleasant, but I wonder what would happen if the beans were roasted and the “chocolate” tempered. The taste is chocolate like, but not really chocolate; it’s hard to describe. It’s a little bitter, very fermented tasting with caramel overtones. I don’t think anyone who is into dark chocolate would mistake this for cacao, but you wouldn’t hate it. It’s a variation on a theme, I’d say. I wish we had had more time in Amsterdam to explore their local artisan chocolate scene, but the Cacaomuseum was a wonderful find. If, like us, you visit Amsterdam in a narrow timeframe and want to check out a range of chocolate makers, I recommend you visit Henkjan at the Cacaomuseum. The place is charming, and Henkjan will have some delicious, interesting chocolate you should try. I can’t wait to go back and see if he has any more Krak! Date posted: September 21, 2018. This entry was posted in Chocolate around the World, European chocolate, Featured, Front page and tagged AMMA, Amsterdam, Cacaomuseum, child labor, Droste, Droste Effect, dutch process, Ecuador, Friis Holm, Krak, Krak Chocolade, Kuna, Mexico, Original Beans, Peru. Bookmark the permalink.